IUP President Michael Driscoll will be featured on the August 2 episode of “Infinite Opportunities,” a half-hour, public affairs program featuring Pennsylvania’s State System of Higher Education universities. The show airs at 2:00 p.m. on the Pennsylvania Cable Network, the statewide public affairs network. The program, which airs weekly, features stories about unique programs, student life, and academic offerings at the 14 State System universities. It also includes interviews with university leaders and stakeholders as well as one-on-one discussions between State System leaders and the university presidents. 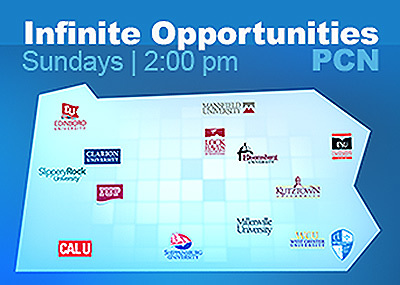 Each episode is available for viewing on the Infinite Opportunities website the Wednesday after it airs on PCN.